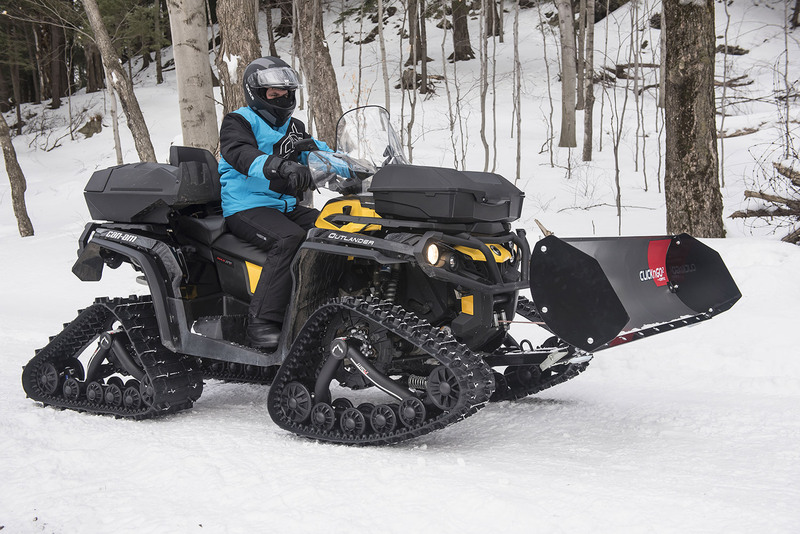 With winter settling in across the North American snowbelt it is time to put your ATV or UTV to good work with a quality snowplow. The Click N Go snowplow from Kimpex has always been a reliable choice, but it's now easier to use and way more efficient thanks to its Gen 2 design improvements. •	Quick mount system for easy attachment that litterly takes seconds. Removal is just easy and gives you full-unrestricted clearance when not pushing snow. •	Large handle that aides in installation, removal and angle adjustment. •	Foot pedal activated angle adjustment for quick adjustment when pushing snow off to the side of the vehicle. •	Dual pivot lift that raises the blade a full 16” off the ground compared the standard 8-10” of lift of conventional plows. •	Heavy-duty gauge steel construction that withstands the punishment of uneven surfaces and iced sections of snow. •	Extended frame mounts available for ATV and UTV track systems.